The Rocky Flats Plant was a United States nuclear weapons production facility near Denver, Colorado that operated from 1952 to 1992. It was under the control of the United States Atomic Energy Commission (AEC) until 1977, when it was replaced by the Department of Energy (DOE). Full Body Burden is a haunting work of narrative nonfiction about a young woman, Kristen Iversen, growing up in a small Colorado town close to Rocky Flats, a secret nuclear weapons plant once designated “the most contaminated site in America.” It’s the story of a childhood and adolescence in the shadow of the Cold War, in a landscape at once startlingly beautiful and–unknown to those who lived there–tainted with invisible yet deadly particles of plutonium. It’s also a book about the destructive power of secrets–both family and government. Her father’s hidden liquor bottles, the strange cancers in children in the neighborhood, the truth about what was made at Rocky Flats (cleaning supplies, her mother guessed)–best not to inquire too deeply into any of it. I do not normally advise the US to attack third world countries. Especially over oil. But in this case the mad man is attacking his own people. The chaos is shutting down the oil fields in Libya and rippling through the oil world. He is threatening to set the oil fields on fire. He ordered naval vessels to bombard Tripoli. Where is the 5th Fleet when you need them. Posted today at 10:37 a.m.
U.S. gas prices jumped 6 cents overnight, as the recent spike in oil prices begins to hit filling stations across America. That marks the third day in a row that prices have risen, and brings the national average to the highest level since October 2008. The national average price for a gallon of regular gas rose 5.9 cents to $3.287, motorist group AAA said Friday. Gasoline also jumped 6 cents overnight in Chicago, where prices averaged $3.497. So far this week, gas prices have increased nearly 12 cents a gallon. And analysts expect prices to continue higher in the next few days following a sharp rise in the price of crude oil. Gas prices were highest in Hawaii, where drivers paid $3.757 a gallon, on average. Wyoming had the lowest gas prices at roughly, $3.014 a gallon. The jump in pump prices follows a surge in prices for crude oil, the main ingredient in gasoline. Oil prices were holding near $98 a barrel early Friday morning, one day after prices hit a high of $103 a barrel — the highest since October 2008. Economists warn that an energy price shock could hurt the economic recovery in the United States. In general, every $1 increase in the price of oil costs consumers $1 billion over the course of a year. That’s concerning because consumer spending makes up the bulk of U.S. gross domestic product, the broadest measure of economic growth. Oil prices have been driven higher by political unrest in North Africa and the Middle East, where much of the world’s oil comes from. Despite the surge in prices this week, the amount of oil that has been taken off the world market has been relatively minimal. Sorry no Post today. I was helping a Vet and his family today. COTONOU — Pirates attacked an oil tanker off the coast of west Africa, killing a Ukrainian officer before escaping with the contents of the ship’s safe, the ship’s owners and Benin’s navy commander said Tuesday. Commander Maxime Ahoyo said the officer on the Monrovia-flagged Cancale Star was shot dead when he confronted the pirates after they boarded the vessel in darkness 18 nautical miles (33 kilometres) off the coast of Benin. The tanker’s Latvian captain, Jaroslavs Semenovics, said around six or seven pirates had approached the tanker in a speed boat. “They came on deck, pointed a pistol to the head of one of the sailors, marched him to the cabin,” Semenovics told AFP. “They asked me to open the safe and they collected all the cash,” he added. He did not say how much was stolen. The 230-metre (750-foot) Cancale Star was carrying 89,000 cubic metres of crude from Nigeria’s Niger Delta, the captain said. Medics aboard the vessel said four other crew members were wounded in the attack, one seriously. The pirates fled after a member of the tanker’s crew raised the alarm by sounding a siren, with the crew managing to overpower a pirate and hand him over to police for questioning. The captured pirate said he was from a Nigerian border town. The multinational crew of 24 includes Russians, Filipinos, Latvians and Ukrainians, Radings said. Piracy in oil-rich west African waters is on the rise, according to the International Maritime Bureau, with more than 100 cases last year. Most attacks occur while ships are at anchor or close to the shore, unlike in east Africa, where Somali pirates have netted millions of dollars in ransoms in exchange for the release of ships captured hundreds of miles from the coast. It said that pirates have attacked and robbed vessels and kidnapped crews along the coast and rivers, anchorages, ports and surrounding waters. Officials voiced fears earlier this year that west African pirates would copy the tactics of Somali gangs. What shall we call this? Poor people gone wild? There are after all no fish in the sea. What the Industrialists of the world and their Bankers do not want you to see is that the oceans are depleted, the atmosphere is seriously screwed up (not just with green house gases), and the land has effectively been stripped. Humanity has literally sucked the resources out of this planet, goaded on by religious and political leaders. Human activities have already pushed the Earth beyond three of the planet’s biophysical thresholds, with consequences that are detrimental or even catastrophic for large parts of the world, conclude 29 European, Australian and U.S. scientists in an article in Nature. This force has given rise to a new era – Anthropocene – in which human actions have become the main driver of global environmental change. “On a finite planet, at some point, we will tip the vital resources we rely upon into irreversible decline if our consumption is not balanced with regenerative and sustainable activity,” says report co-author Sander van der Leeuw, of Arizona State University. The report started with a fairly simple question: How much pressure can the Earth system take before it begins to crash? “Until now, the scientific community has not attempted to determine the limits of the Earth system’s stability in so many dimensions and make a proposal such as this. We are sending these ideas out to be vetted by the scientific community at large,” explains van der Leeuw. Nine boundaries were identified in the report, including climate change, stratospheric ozone, land use change, freshwater use, biological diversity, ocean acidification, nitrogen and phosphorus inputs to the biosphere and oceans, aerosol loading and chemical pollution. The study suggests that three of these boundaries -climate change, biological diversity and nitrogen input to the biosphere – may already have been transgressed. Using an interdisciplinary approach, the researchers looked at the data for each of the nine vital processes in the Earth system and identified a critical control variable. Biodiversity loss, for example, is based on species extinction rate, which is expressed in extinctions per million species per year. They then explored how the boundaries interact. Here, loss of biodiversity impacts carbon storage (climate change), freshwater, nitrogen and phosphorous cycles, and land systems. 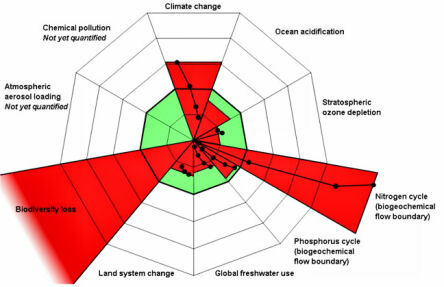 The researchers stress that their approach does not offer a complete roadmap for sustainable development, but does provide an important element by identifying critical planetary boundaries. They also propose a bold move: a limit for each boundary that would maintain the conditions for a livable world. For biodiversity, that would be less than 10 extinctions per million species per year. The current status is greater than 100 species per million lost per year, whereas the pre-industrial value was 0.1-1. “Three of the boundaries we identify – 350 parts per million of atmospheric carbon dioxide, biodiversity extinction rates more than 10 times the background rate, and no more than 35 million tons of nitrogen pollution per year – have already been exceeded with fossil fuel use, land use change, and agricultural pollution, driving us to unsustainable levels that are producing real risks to our survival,” notes report co-author Diana Liverman, of the University of Arizona. Mass extinctions require 2 events. In other words the Dinosaurs didn’t evolve into birds because of a single event…the comet strike. What happened was they filled every niche, ate themselves out of house and home. Probably started eating themselves, thus the gigantisism movement AND then the comet struck. Humans are heading for the same fate. Feb. 17, 2009 — As agents of extinction, comet and asteroid impacts may be losing their punch. According to a new theory about how mass dyings work, cosmic collisions generally aren’t enough to cause a major extinction event. To be truly devastating, they must be accompanied by another event that inflicts long-term suffering, like runaway climate change due to massive volcanic eruptions. In other words, a comet couldn’t have killed the dinosaurs by itself — unless they were already endangered species. This kind of one-two punch could explain more than the extinction of dinosaurs, Nan Arens of Hobart and William Smith Colleges said. In a recent paper in the journal Paleobiology, she and colleague Ian West argue that there are two types of events that can cause extinctions — “pulses” (quick, deadly shocks, like comets) and “presses” (drawn-out stresses that push ecosystems to the brink but may not kill outright, like million-year-long volcanic eruptions). WATCH VIDEO: What constitutes a mass extinction? But are all mass extinctions created equal? Can researchers come up with a “Grand Unified Theory” of ancient apocalypse?West and Arens think so. They combed the last 300 million years of geologic record, noting impact craters, massive eruptions, periods of ancient climate change, and then comparing them to extinctions. The rate at which species die off spiked dramatically, they found, when a “pulse”-type event occurred within a million years or so of a “press.”The theory fits well for the dinosaurs. Around the time of their demise 65 million years ago, a comet slammed into the Yucatan Peninsula and a huge volcano, the Deccan Traps, was erupting in what is today India.